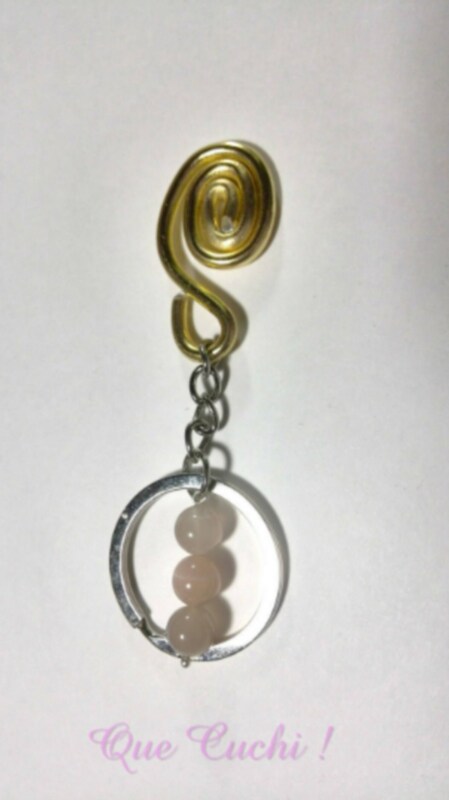 Golden Keychain that clings to the bag with three beads of faceted Golden Moon stone. Keychain handmade that clings to the bag to find keys more easily with 3 mm gilded aluminum wire and three beads of Faceted Golden Moon stone, the keychain ring is silver metal. The Moonstone or Adular symbolizes the Stone of Aphrodite. It symbolizes the candor of the child. This stone is virtuous, without malice, spontaneous and naturally good. Keychain that clings to the blue bag with a turquoise stone tear. Keychain that clings to the copper bag with two tiger eye beads. Macramé stone bracelet of golden moon.